Es gibt berechtigte Zweifel an der Story von NYT und so kommen nun auch die "Außerirdischen Artefakte" in den Focus. Wenn es aus dem Weltraum käme, würde diese Reise auch verräterische Zeichen im Metall hinterlassen, in Form von Debris und Ionisierung (Veränderungen der elektrischen Ladungen der Atome in der Substanz). 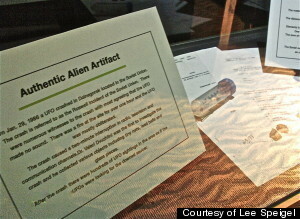 Many high-ranking people in the federal government believe aliens have visited planet Earth. 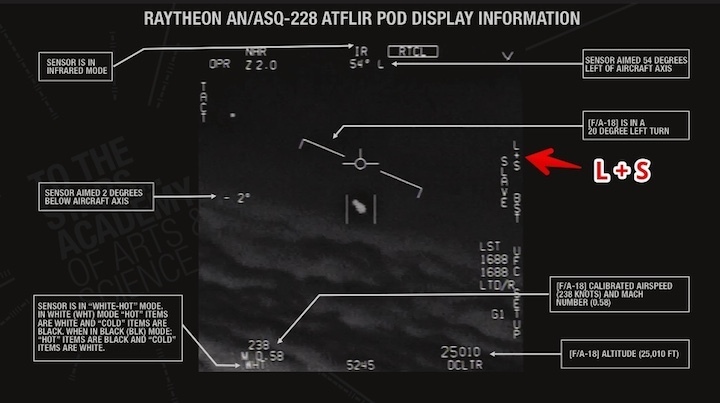 Military pilots have recorded videos of UFOs with capabilities that seem to outstrip all known human aircraft, changing direction and accelerating in ways no fighter jet or helicopter could ever accomplish. In a group of buildings in Las Vegas, the government stockpiles alloys and other materials believed to be associated with UFOs. Points one and two are weird, but not all that compelling on their own: The world already knew that plenty of smart folks believe in alien visitors, and that pilots sometimes encounter strange phenomena in the upper atmosphere — phenomena explained by entities other than space aliens, such as a weather balloon, a rocket launch or even a solar eruption. Point No. 3, though — those buildings full of alloys and other materials — that's a little harder to hand wave away. Is there really a DOD cache full of materials from out of this world? Here's the thing, though: The chemists and metallurgists Live Science spoke to — experts in identifying unusual alloys — don't buy it. Alloys are mixtures of different kinds of elemental metals. They're very common — in fact, Sachleben said, they're more common on Earth than pure elemental metals are — and very well understood. Brass is an alloy. So is steel. Even most naturally occurring gold on Earth is an alloy made up of elemental gold mixed with other metals, like silver or copper. "There are databases of all known phases [of metal], including alloys," May Nyman, a professor in the Oregon State University Department of Chemistry, told Live Science. Those databases include straightforward techniques for identifying metal alloys. For crystalline alloys — those in which the mixture of atoms forms an ordered structure — researchers use a technique called X-ray diffraction, Nyman said. "The X-ray's wavelength is about the same size as the distance between the atoms [of crystalline alloys]," Nyman said, "so that means when the X-rays go into a well-ordered material, they diffract [change shape and intensity] … and from that diffraction [pattern] you can get information that tells you the distance between the atoms, what the atoms are, and how well-ordered the atoms are. It tells you all about the arrangement of your atoms." "These are all very standard techniques in research labs, so if we had such mysterious metals, you could take it to any university where research is done, and they could tell you what are the elements and something about the crystalline phase within a few hours," Nyman said. "There are no alloys that are sitting in some warehouse that we cannot figure out what they are. In fact, it's pretty simple, and any reasonably good metallurgical grad student can do it for you," he said. Nyman said that if metals did fall from some mysterious aircraft, some forensics experiments would quickly answer a lot of questions about that aircraft. "How has the hunk of metal changed?" Nyman said. "From my scientist's perspective, that's the kind of question I'd be asking. Maybe, if it has to do with world politics, and we want to know where the metal comes from, maybe there's some analysis that can lead you to where it was mined, or what country uses that particular alloy, that kind of thing." If the aircraft had come from space, Nyman said, that travel would leave telltale signs in the metal as well, in the form of spacefaring debris and ionization (changes to the electrical charges of the substance's atoms). Even if a chunk of alloy that hadn't been seen before did fall to Earth from outer space, both Nyman and Sachleben agreed that it wouldn't necessarily have come from an alien craft. In fact, Sachleben said, alloys strike the planet regularly — space-traversing alloys like those found in fairly common nickel-iron meteorites — leaving behind telltale signs. The meteor that wiped out the dinosaurs was even identified by the rare-Earth metals it left behind in certain geological formations in Earth's crust. "The company [involved in the DOD research] modified buildings in Las Vegas for the storage of metal alloys and other materials that … program contractors said had been recovered from unidentified aerial phenomena. Researchers also studied people who said they had experienced physical effects from encounters with the objects and examined them for any physiological changes. In addition, researchers spoke to military service members who had reported sightings of strange aircraft." From this statement, there's no actual sign that there's anything unusual about the alloys themselves. 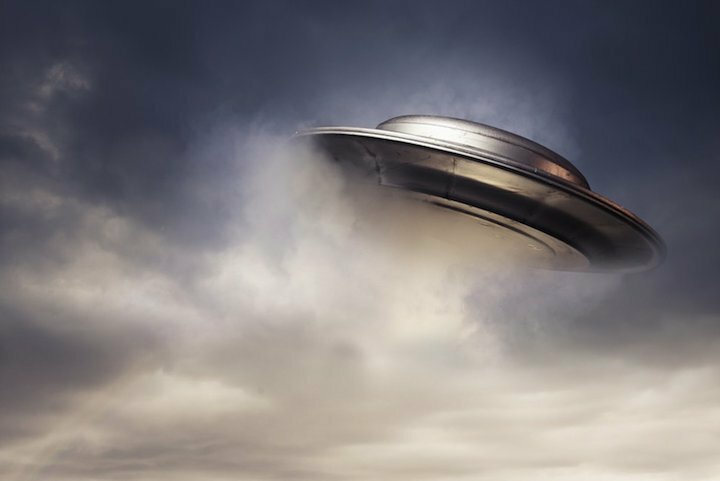 All the Times wrote was that the DOD researchers tasked with finding weird UFO stuff collected some metal, interviewed some people who had claimed startling experiences with it, and decided that it was UFO-related. In an email to Live Science regarding these metal alloys, Blumenthal said, "We printed as much as we were able to verify. Can't go beyond that." As for whether there's an explanation at least for the metals themselves, Sachleben said: "There's not as many mysteries in science as people like to think. It's not like we know everything — we don't know everything. But most things we know enough about to know what we don't know." Is this accurate? We're saying they're both watching one of these screens and misidentifying the rotation based on that? All of the discussion about whether they're talking about the flir pod rotating.. "LOOK AT THAT THING!" etc. That is of course assuming, am i correct, that we are hearing from 2 pilots in the same jet who are not looking at this object through their windscreen, but purely seeing this and commenting on it while viewing it on a TV screen? You can see the rotation on a cell phone. Any idea how far away the thing is? Is range indicated? Seems like a sensible question - were they looking at it solely on the display, or was it also visible to the naked eye? There is reference to seeing a whole fleet of them on the ASA, or radar. Again this is conflation with the Nimitz video. AFAIK, there is really nothing but the video from the "Gimbal event". It's not even clear if this was ever officially designated as an UFO incident. The FLIR system does neither provide speed nor distance of the locked object. It is indeed the GIMBAL video that features chat between F-18 pilots/pilot and WSO. As the FLIR does not provide distance information, we don't know if the object was visible or not at the time the commentary goes "My gosh!" or "It's rotating". It would clearly weaken the assertion here that perceived object rotation was actually IR glare if they were observing it visually. Right, I've missed that. Anyway, lacking any contextual information there are many possibilities, including the one that this material has been explained DOD-internally already. We just don't know. I'm totally aware of that. I'm not questioning whether its possible to see the rotation on a small screen. I'm asking is that the assumption we are making at this point; that they're commentating on what they're seeing on the screens rather than with the naked eye? Given the poor quality of the image in the display it's likely that it's invisible to the naked eye. The ATFLIR system is designed with a powerful zoom to enable them to see things that are far away. We can get the apparent size from the zoom level. The Advanced Targeting Forward Looking Infrared (ATFLIR) system provides three pilot-selectable fields of view (FOV): Wide field of view (WFOV), which is 6°x6°, medium field of view (MFOV), which is 3°x3°, and narrow field of view (NAR) which is 1.5°x1.5°. Each field of view can be further narrowed by up to 2x in 10 discrete steps. We can see it is in narrow mode ("NAR") with 2x zoom level ("Z 2.0"). 20/20 vision is defined as being able to resolve 1 arc minute. So to the naked eye this thing is a tiny dot, rotation would be barely observable and certainly not enough to cause such exclamation. TACT = Menu type ????? 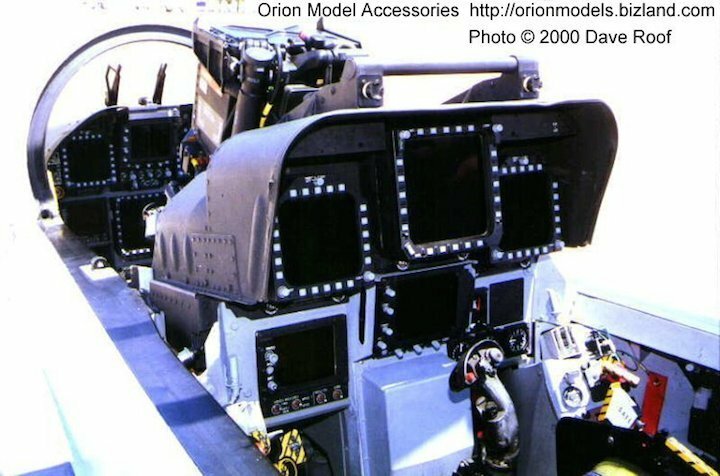 OPR = Operational, i.e. it's switched ona nd working. 54° L = Heading of camera relative to aircraft ground track. "Lookpoint Azimuth Indicator"
SLAVE = OFF, "Trackfile Slaved Mode"
BST = OFF Boresight slaved mode. LTD/R = Laser Target Designator/Ranger (LTD/R) OFF "Provide automatic or manual laser designation and ranging data. With the LTD is it possible to create a designation and lase it from ownship completely autonomously, allowing delivery of laser-guided weapons completely autonomously." 5246 = Mission Time in minutes and seconds, sometimes followed by "A"?? DCLTR = Declutter off (not boxed). If on then airspeed etc is not shown, to declutter the display. We can get some ballpark figures for distance from this. Let's say the target is about the size of an F/A-18 Hornet, 44 ft wingspan with a bit extra for IR flare, like 50 feet. 50/tan(0.0447 degrees) = 64089 feet. (12 miles away). Alternatively if it's actually a distant airliner with a 200 foot wingspan, and the "saucer" shape is actually flare, then the effective length on the long visual axis there would be more like 500 feet. Hence 120 miles away. Ha, I was typing the exact same stuff simultaneously. I got a smaller angle though. I think your measurements are a bit off, as if I resize the image to 464px then the longest dimension of the apparent object is (generously) 34 pixels not 42.